Independent charity Crimestoppers is today offering a reward of up to £5,000 for information on the attempted murder of Ross Monaghan outside St George’s Primary School two weeks ago. Mr Monaghan, (35), was shot in the back by a man pushing a buggy, who pulled out a gun at just after 9am on Monday,January 16. The shooting happened as Mr Monaghan was dropping off a child at the school. The armed man was wearing a blue padded jacket, blue jeans, a woolen scarf pulled up to cover his face and a dark woolen bobble hat. Crimestoppers is now offering a reward of up to £5,000 for information passed on to the charity that leads to the arrest and conviction of any person responsible for the shooting. 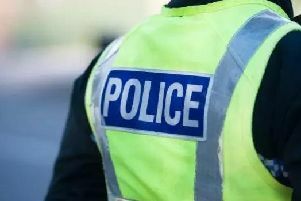 Angela Parker, national manager of Crimestoppers in Scotland, said: “It’s shocking to think that this attempted murder happened right in front of a busy primary school in broad daylight at the start of the school day. “The parents of the school and the nearby Penilee estate have a right to feel safe, especially when they are dropping of children in front of the school gates. The reward will only qualify if information is passed to Crimestoppers’ 0800 555 111 number or anonymous online form at www.crimestoppers-uk.org. Information passed directly to police will not qualify for payment of any reward.